YOUNGSTOWN, Ohio –Five years ago, Zac DiVencenzo was a student at Youngstown State University majoring in industrial systems engineering when his world took a major turn. 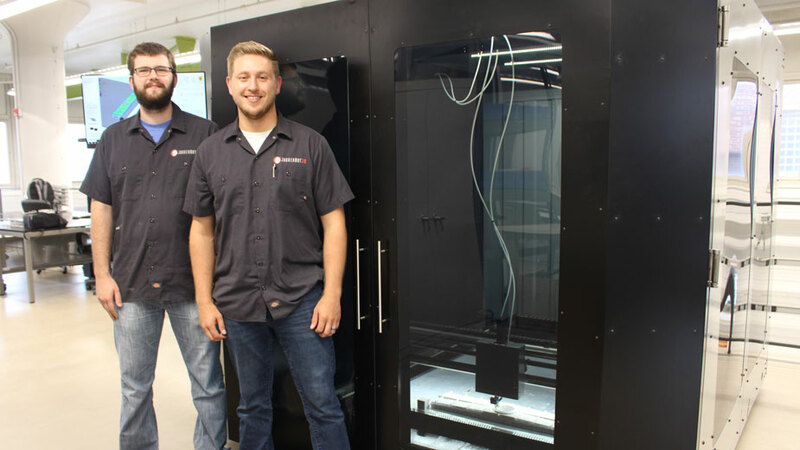 YSU was in the early stages of developing its additive manufacturing program and some of the new equipment was being stored in the industrial systems classroom in the basement of Moser Hall, since the university had not yet finished lab space for the machines. It was then that DiVencezo noticed a sizable gap in the market for 3D printers. The top-line commercial printers cost upward of $500,000 and were only available to some of the biggest manufacturers. On the other end of the spectrum, smaller desktop printers were coming down in price and were available at retailers such as Best Buy. “There was no middle ground,” he says. That spurred DiVencenzo to think about how he could build 3D printers that were of good quality and affordable to manufacturers or other end-users. In 2014, he co-founded Juggerbot 3D, a portfolio company at the Youngstown Business Incubator that was among the first this year to move into the newly renovated Tech Block Building 5. The building was developed by the YBI to house companies devoted to additive manufacturing. The space for Juggerbot was perfect, DiVencenzo says, since it’s on the ground floor and accommodates some of the larger printers the company designs and assembles. Brian Zellers and Zac DiVencenzo have geared Juggerbot 3D to serve the medical, transportation and general industries. “We started building desktop machines,” he says, that is, printers that could fit on a table and produce small components. Today, the company manufactures material extrusion printers that use various types of plastic to create parts or prototypes. Additive manufacturing is a form of production that builds parts or products layer-by-layer based on a digital schematic that is programmed into a 3D printer. Juggerbot makes printers that are used by clients in the medical, transportation and general industrial fields. “We do all of the design in-house,” DiVencenzo says, including the electrical wiring and overall aesthetics of the machine. Most of the electrical components are sourced and purchased from outside vendors, while Charles Mfg. Co. in Warren does any metal fabrication needed for the devices. Kiraly Tool & Die, Youngstown, performs any intricate machining work needed on the printer. Juggerbot’s smallest design is the ME12 C – a fairly simple printer that is encased in stainless steel and fed by a coil of thermoplastic filament akin to the string you would use on a weed trimmer. As the filament is fed through, it melts and is deposited through a nozzle that moves along a pre-programmed route, building the piece as the plastic cures. These printers are capable of producing parts 12 inches in height, depth and length, DiVencenzo says. This particular printer – priced at $20,000 – has attracted interest from medical companies that see the value in using the technology to produce medical products. Juggerbot last year won a project award of $500,000 through the state of Ohio to showcase this technology. The goal was to prove the technology out in three phases. The first was to demonstrate how biopolymer material developed by FibreTuff can be used to 3D print these parts. “Phase II was to demonstrate scan-to-print technology,” DiVencenzo says, and the company teamed up with Whiteside Orthotic and Prosthetic Group in Canfield. The idea is to use scanning technology to make a digital image of a patient’s foot, for example, and then print out a customized insert that would be fit to the person’s foot dimensions. The third phase incorporates technology in making implants such as sensors that might accompany an orthotic or prosthetic part. These sensors could detect whether the piece is receiving the appropriate amount of pressure from the body. “We’ve grown from first-stage prototyping, received some investment and grants, and are finding our first customers locally,” he says. Among the first beta partners with the company was Taylor-Winfield, and other project awards have since helped the company expand its ability to manufacture machines that can produce larger parts. “Quaker City Castings in Salem decided to take a risk with us and allow us to build our first large machine,” DiVencenzo says. The printer is able to print components as big as four feet in height, length and depth. The larger machine sells for $70,000, he says. A machine this size – it runs about the length of a small car with enough room inside to stand – was designed and assembled in Juggerbot’s workspace in Tech Block 5. Once the equipment is tested, it’s shipped out through the front of the office, which is conveniently an aluminum garage door with glass windows that simply slides so the large machine can be moved out. To date, Juggerbot has manufactured five commercial printers, and has an order for six more. Brian Zellers, who has been with the company two and a half years, says his background is in electrical biomedical engineering. While the electrical design and construction of the printers is his forte, there was a learning curve when it came to understanding additive manufacturing. Juggerbot manufactures printers that use thermoplastic materials and does not make ones that use metals, DiVencenzo says. By next year the company expects to develop a new 3D printer that is able to melt material directly from pellet form instead of from plastic filaments. Traditionally, plastic pellets are used to manufacture the filament, but the new design and technology bypasses this step. More recently, the company was awarded its first patent on a push/pull drive system it installed on its base 3D printer and is nearing the final stages of securing a new round of investment in excess of $1 million. “Should we get this investment, we’d bring on another five people,” he says. Juggerbot today employs three. Though he declines to provide revenue details, DiVencenzo says the market for additive manufacturing in the long term is very strong. The beauty of additive manufacturing is that it helps unleash the creativity and imagination of the next generation of manufacturers and engineers, DiVencenzo says.